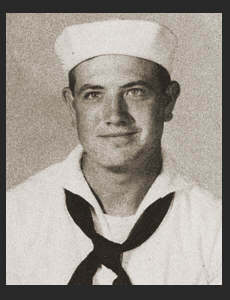 S 1/c Kenneth E. Arnold, son of Ruby Witt, graduated from Manitou High School and Draughn's Business College; busband of the former Lois Gritzmaker. Entered Navy, trained in Camp Harrihan, La., Galveston, Texas, San Diego, Cal., Illinois, Curtis Bay, Md., and Camp Bradford, Ba. ; served in Africa, Panama, Costa Rica and Alaska. Discharged in Oct., 1945. Awarded Good Conduct Medal, Am. Defense Ribbon EAME Robbon, Asiatic Pacific Ribbon.